“Can’t believe, after the miserable suckstorm we went through in ’15–” CLANK “you wanted to come–” CRUNCH “racing again,” Baja driver Ron Stobaugh said between thwacks to his Jeep’s undercarriage. We were crawling and clawing through our Baja 500 pre-run, where we learned one thing: we’re forked. I’ll be racing in the 2017 SCORE Baja 500, presented by Monster Energy, televised by our sister company the El Rey Network, and running over a 513.67-mile loop from Ensenada to about halfway down the Baja peninsula and back. I’m in the right seat co-driving for a bit with the same team that let me navigate a section of the 2015 Baja 1000– Ron Stobaugh, his son Austin Stobaugh and business partner Mike Jams’ Desert Race School out of Orange County, California. Two years ago I was tricked into thinking I’d have “basically nothing to do” navigating for Stobaugh, a Baja veteran, and come out the other side with a pleasant experience to write about. Of course, only half of that ended up being true and my free Mexican vacation turned into a 16-hour hellride. I got into the race car late at night after the first day of the race and didn’t get out until late afternoon the next day. Our team made it across the finish line but it took us 36 hours to get there. We would have had to have done it in under 33 to get an official time. Anyway, the 500 is half the distance so was hoping it’d be half as hard. I mean, right? But after scouting our section over the long weekend, which includes more than 60 miles of extremely steep, rocky and narrow tracks, I’m not so sure. Basically, Baja racing is all about fast-blasting across loose but shallow sand and dirt. 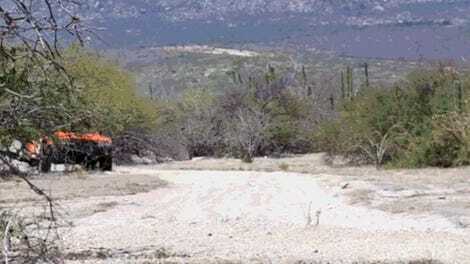 That type of terrain is punctuated with rocky sections and deep, soft silt beds, but a lot of a Baja race course usually looks like a slightly sandier rally stage. On that kind of terrain, rear-drive trucks and buggies can really fly. But this year, that massive freaking rock mountain I mentioned is going to present a lot of problems. Our little four-cylinder rear-drive truck will need to carry a careful balance of momentum and patience to get over humps without hitting anything too hard. But even the top-end trophy trucks will be in danger of overheating transmissions and getting stuck down there. Want to know what it’s like to prerun? Just let this GIF loop for six hours. And worst than that- the lane through that area is so narrow that even a creative pilot will have a very difficult time finding a passing line without driving off a cliff. And many of us, Stobaugh and myself included, will be running that section at night. “Be smart,” Stobaugh said. “And hope like hell we don’t get stuck in traffic.” Spoken like a true Californian. Joking aside, the plan is for our lead driver Mike Jams and co-driver Robby Hartman to take the truck from the start on Saturday afternoon through the first third of the race, hand it off to us for basically the southernmost section, and if the sand gods will it, Stobaugh senior and I will pass the vehicle on to Stoubaugh junior and his co-driver Shannon Boothe who will take it to checkers. It sounds fairly simple, but I promise there’s going to be plenty of pain in between. We’ll record as much of it as we can for your entertainment. The race goes down Saturday, June 3. Stay tuned this week and afterward to see how we do, and get ready to catch some excellent race coverage on the El Rey Network later this year.